A sumptuous, succulent whisky from Springbank’s triple distilled Hazelburn brand. A 2007 vintage, this was aged initially in first-fill Bourbon casks, before being finished in Barolo wine casks. Barolo wines range from dry to medium-bodied, and are known for their intense berry flavour – perfect for adding a touch of fruitiness to single malt whiskies. 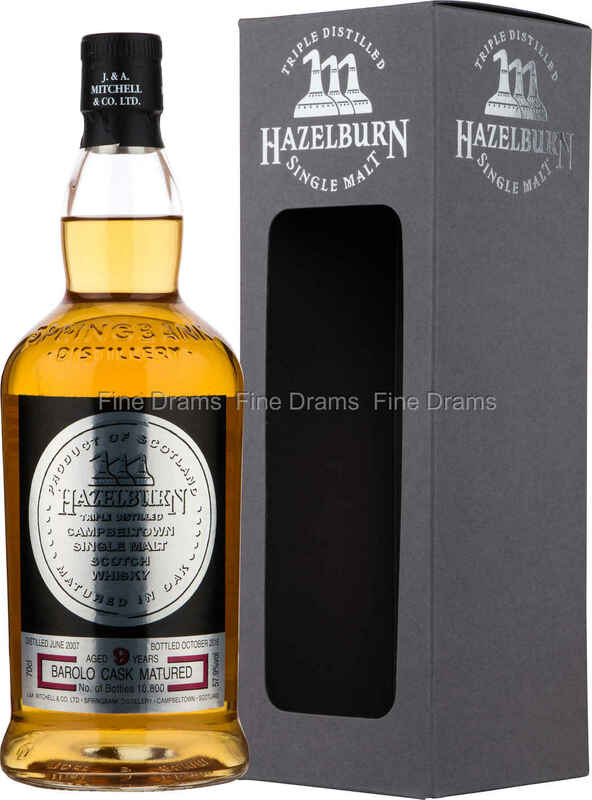 Hazelburn is, of course, unpeated, and here the whisky offers flavours of almond, toffee, corn-rich vanilla, light tea-tannins, sugar citrus, chocolate, fresh berries, cooked apples and French custard. A truly beautiful dram that exceeds its 9 years with great complexity and depth. This whisky has a restrained wine cask influence which never overwhelms the product, keeping a good balance with the flavours of the fresh Bourbon cask. Bottled at a formidable cask strength of 57.9% ABV, and without chill filtration or colouration, this Hazelburn has plenty of youthful energy and vibrancy, ensured by Springbank’s meticulous production methods and commitment to quality. Just 10,800 bottles were produced.